Contains premium organic and wild-crafted: Vetiver, Patchouli, Lavender, Spruce, Basil, and Sandalwood essential oils. Researchers have investigated the natural calming and therapeutic properties of many of the essential oils found within Quiet Scent™ blend. Lavender, in particular, has been found to have sedative effects while also reducing tension-anxiety and confusion. 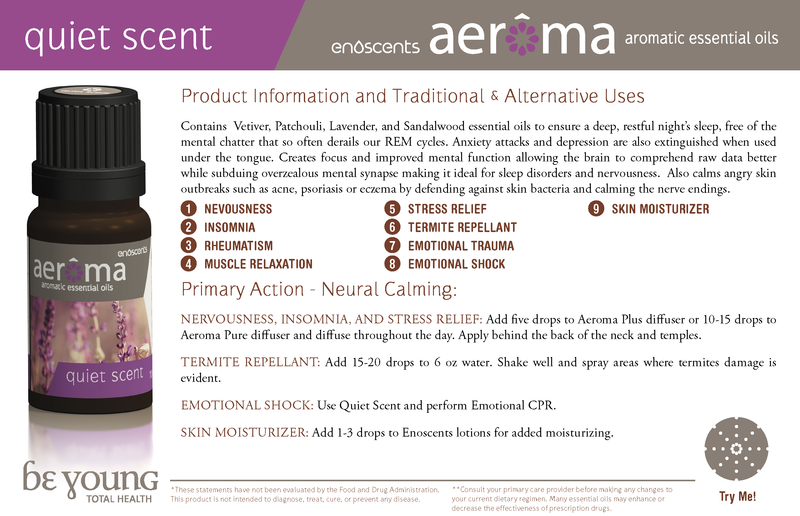 The combination of essential oils contained within Quiet Scent™ is specifically combined to calm the mind, relax the body, and improve sleep, while helping to control the overactive thoughts that tend to accompany an to keep awake and overstimulated. Apply 1-2 drops on the neck of the big toe, pulse point on the wrists, back of the neck, on the temples, or in the inner corner of the nostrils. were never irradiated. The oil was never tested on animals.